Acres of English-style flower gardens, organic veggie and herb gardens and hiking trails surround this Vermont spa and culinary resort. Use the resort's snowshoes in winter and their bicycles in the summer, then come home to dinner at The Tavern with sustainable local ingredients—plus a good wine list and Vermont microbrews—and a fireplace suite (optional). Rooms range from small traditional roosts—some with fireplaces—to suites with hearthstone gas stoves. The look is Vermont country: pine dining tables, rocking chairs. Don't miss the spa; it's a high-end experience with products by Skin Authority, Epicuren, and Aromafloria, and nice steam rooms and relaxation areas. This pet friendly resort has plenty of room to romp plus pet treats—with "Doggy Dinners" room service and even cooking classes to make them (check the Cooking Academy schedule and the dinner menu for Rover). With an open kitchen at one end and a hearth at the other, Junction is a warm, lively place to dine on organic cuisine prepared by the resort's team of talented chefs. Order a la carte or enjoy the 5-course tasting menu. Tavern's casual pub fare menu has a Vermont foodie twist (Duck Duck Goose, Monkey Bread) plus local microbrews, an award winning wine list and craft cocktails. Cook Academy Classes include a 3-4 course meal paired with wine. Done cooking? 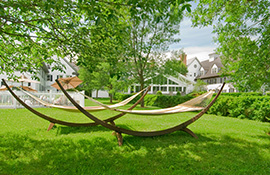 Try rock climbing, hot air ballooning, the hiking trails, or our favorite acitivity: "Vermont hammocks". The Essex Resort & Spa is about 30 minutes from downtown Burlington. First night's room and tax required at time of booking. This deposit is refundable, less a $20 processing fee, if cancelled 24 hours in advance of arrival. If less than 24 hours notice then deposit is forfeited. Your meeting, Your way – whether it is a corporate sales meeting, board meeting or brain-storm session, The Essex Resort & Spa’s flexible ballroom and their versatile smaller meeting areas offer high speed connectivity and all your audio visual equipment needs. This upscale and professional environment is the perfect setting for your Vermont meeting. And what is a productive meeting without inspired “brain” food? The Essex’s renowned Chefs are ready to serve up the most scrumptious delights in the state. Their talented and committed Sales/Catering team will offer individualized and personalized attention to your meeting. **The Ponds is located offsite at The Bolton Valley Resort, approximately 30 minutes from The Essex. Shuttle transfers available.